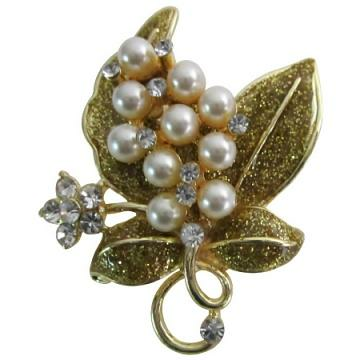 This beautiful Pearly Flower Brooch with golden Glittered leaf pearls flower with rhinestones flower on side attractive brooch. This romantic flower brooch looks like a daisy or plumeria & will make an elegant addition for a special outfit or everyday wear. Truly a versatile piece this brooch can either be pinned on your gown or sashes. All orders will be processed within 3 - 5 business days as most pieces are made to order. If you have any other question, please contact us. All merchandise is shipped from our warehouse in MN, USA. We use USPS for all your shipping needs. Free Shipping for all orders within USA, via USPS First Class Mail. We make every effort to keep a good stock of all the items on our site. Occasionally, a high-demand item may be sold out. If an item you ordered is sold out, we will notify you via email. If, for some reason, you would like to return your item, please notify us within 7 days of receipt of your item. Then please send the item back in the original packaging and we need to receive it within 30 days. Once we receive the package, you will be issued a refund. Return amount is for item purchase price only. Shipping cost, Insurance paid will not be refunded. No RETURNS will be accepted after 30 days of you receiving your order. No Exceptions, Please. This item in Anklets / Bands / Brooch category was first added to our catalog on 11-07-2015. Buy Breathtaking Gift Golden Glitter Leaf & Pearls Flowers Romantic Brooch, sold & shipped by Fashion Jewelry For Everyone where you can shop online for Leading Online Retailer for Indian Fashion Jewelry. This Brooch, Pins & Bands collection has been tagged as Gift Brooch,Gift Pearls,Glitter Brooch,Brooch Gift,Brooch Pearls,Pearls Gift,Pearls Brooch,Breathtaking,Gift,Glitter,Brooch,Pearls,Pearls Brooch. Disclaimer: Please note that children under 3 years of age should only wear any type of Jewelry with adult supervision. Thank you for the fast delivery. The readymade saree is really cute and fits my daughter perfectly. I will recommend desiclick to others.